There is something to be said about people too stubborn to change their ways. Take for example this man, who casually enjoyed a morning Starbucks coffee while a flood slowly encircled his table. 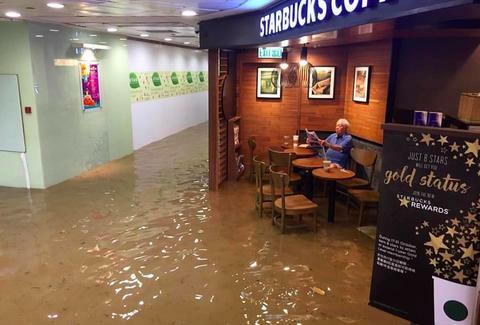 Quickly dubbed “Starbucks Uncle” by the tweeting hordes of the internet, the man sat reading a newspaper during the height of heavy rainstorms that have brought floods to Hong Kong earlier this week. According to the BBC, the picture was taken by a 23-year-old medical worker named Kristy Chan, who said it was likely the man was un-phased by the treacherous water because he’s old. "It was quite funny. Maybe he already has that many life experiences so the flood didn't bother him at all,” she said. As with any piece of #content that induces a chuckle or two, the photo has since become viral, and taken over the prime real estate of Reddit’s front page. It’s also gotten the meme treatment on multiple levels, as Starbucks Uncle has become a symbol for nonchalance in all manner of situations. Long live Starbucks Uncle, the man who defied the floods, but probably doesn’t care all that much anyway.